It is hard to imagine a world without women. They play a significant role in our lives be it as mothers, sisters, daughters or friends. With ease, they manage both the home and their work life and never complain. They have not only enriched our lives with their presence but have also shown us the path which leads to a better future. So, this Women's Day appreciate the ladies in your lives for all they have done for you by sending them some wonderful messages and wishes. It would make them happy and make their day more memorable. You are bold, beautiful, compassionate and caring. Wishing you a very happy Women’s Day. As a mother you nature a child and show him the way to become a better human being. Salutations and a very happy Women’s Day. May each and every moment of your day be filled with happiness. Happy Women’s Day! You work so hard all through the year to keep your family happy. You truly deserve a day of rest. Wishing you a very happy Women’s Day. Have fun! Nobody cares for me like you do. Thanks for being there in my life. Love you sweetheart and a very happy Women’s Day. May you get all the happiness and good fortune that you so rightly deserve. Happy Women’s Day! May you always remain young at heart and continue to spread cheer among your loved ones. Wishing you a very happy Women’s Day. Love, compassion and sacrifice. These are the qualities that define a woman. Happy Women’s Day! May you have the joys of a happy married life and the respect and love of your children. Wishing you a very happy Women’s Day. God has given me the greatest gift in the form of you. I am blessed to have you in my life. Happy Women’s Day sweetheart! Wishing a very happy Women’s Day to the most important person in my life. May you continue to prosper. Since the day you have Coe into my life, each and every moment is filled with happiness and happiness. Happy Women’s Day sweetheart! The thing that I most appreciate about you is your never say dies attitude.may you continue to climb the ladder of success. Happy Women’s Day! Being a wife, mother to our kids and a working woman at the same time is not an easy task. But you make it look so easy. A very happy Women’s Day to my hard working wife. May your day be filled with happiness and joy and God bless you with good health. Wishing you a very happy Women’s Day. Without you I would have been incomplete. I feel blessed to have you in my life. Happy Women’s Day! Your heart is pure and your love is selfless. Wishing happy Women’s Day to the most amazing women in the world. May you always shine and spread light all around. Happy Women’s Day! Wishing a very happy Women’s Day to a very loving and caring woman. You are the most precious person for me. Love you always. How would this world look like without women? Like a garden without flowers. Dear mother, you have been my greatest source of inspiration. Thanks for all the Loe and care. Wishing you a very happy Women’s Day. Dear sister, you are my superhero. You are always there for me when I need you the most. Happy Women’s Day! May you continue to blossom and spread your fragrance among the people around you. Happy Women’s Day! For you everything is possible. Juggling home and work needs a lot of energy and you have plenty of it. Happy Women’s Day! A very happy Women’s Day to a brave and bold women who would never accept defeat. You are my greatest strength and fill my life with love and joy. Happy Women’s Day! When you are not by my side my life seems so empty. May we never part. Happy Women’s Day! You fill my heart with so much love and joy. Had you not been there my life would have been so lonely. Happy Women’s Day! Every day I wake up and see your loving face besides me and that is what really makes my day. Happy Women’s Day! We owe our existence to women because it is our mother who brings us into this world. Happy Women’s Day mother, may you aways be happy. Whenever I am by your side I feel like I am in a dream world. I am so lucky to have you in my life. Happy Women’s Day sweetheart. You are an epitome of strength and courage. Wishing a very Happy Women’s Day to a very strong woman. No matter how tough the situation would be, your inspiring words always lifted me up. Happy Women’s Day. Your presence brings so much joy and happiness among the people around you. You are truly amazing. Happy Women’s Day! Wishing a happy Women’s Day to a strong, dedicated, loving and caring wife. God knows how my life would have been without you. Being a woman is not easy. Juggling between family and work needs a lot of patience’ and you have tons of it. Wishing you a very happy Women’s Day. Your words are a source of inspiration to me and drive me to do better in life. Happy Women’s Day! No matter she is fat, short, tall, or curvy, a woman who gives you birth should always be respected. Happy Women's Day! Let's celebrate the reason for our existence. Let's celebrate the women who bore us in their bodies and later in our hearts. Happy Women's Day! Neither her body nor her color, it is her mindset that raises your children. Respect her....Happy Women's Day! If life is a rainbow, the women are the colors of it. Happy Women's Day to all women who contribute to making our lives better. To my dearest wife who has always sorted my life – You are really special to me always and forever. Happy Women's Day! The way you manage work and home is truly inspiring. Thanks for being a part of my life. Happy Women’s Day! Dear sister, you have always bailed me out whenever I was in trouble. Thanks for all that you have done for me and a very happy Women’s day! May your day be filled with happiness, sweet smiles and warm hugs. Happy Women’s Day! May all your dreams come true and you continue to inspire others with you words and deeds. Happy Women’s Day! You are precious. Without you the world would seem so barren and empty. Thanks for making this world a wonderful place. Happy Women’s Day! Mom, thanks for bringing me in this world and raising me through care, love and affection. I owe my existence to you. Happy Mother’s Day! Whenever I was feeling low in life, you were always there comforting and giving me strength to carry on. Wishing a very happy Women’s Day to a wonderful woman! I felt so incomplete but them you came and changed my world for better. Happy Women’s Day! You can be as soft as a flower and at times as tough as steel. You are both bold and caring. Happy Women’s Day! May God gift you good health and wisdom. May you remain young forever. 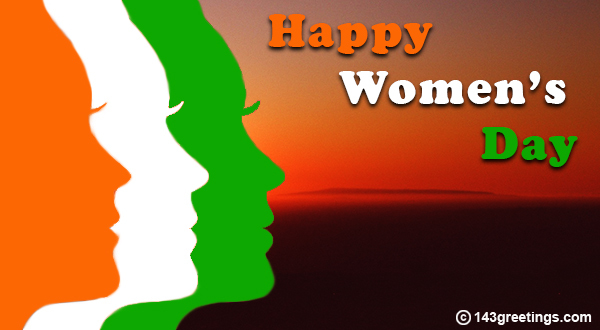 Wishing you a very happy Women’s Day! You are my driving force who motivates me at every step of life. Happy Women's Day, my wifey! You are the best human God has ever created. I am so much in love with you. Happy Women's Day!! Girls with ambition become women with vision.. 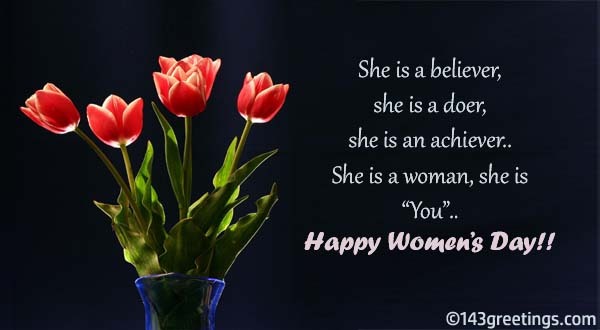 Happy Women’s Day to all lovely women. The most precious thing a man can conquer is a Women’s heart...Happy Women’s Day! She is a believer, she is a doer, she is an achiever.. She is a woman, she is “You”.. Happy Women’s Day!! A strong woman draws inspiration from herself and fights every war bravely.. Celebrating the valor of females... Happy Women’s Day!! A smart woman learns from her failure, smiles during her lows and grows stronger when faced with challanges. You are one of the... Happy Women’s Day! Only a woman can be Wonderful Outstanding Mesmerizing Attractive and Nice at the same time.. Happy Women’s Day!! A Women’s strength can't be defined by how much she achieves rather it can be judged by seeing how much she has struggled for it... Happy Women’s Day!! You are one of a kind.. you are an amazing woman.. Happy Women’s Day!! Dear women you constitute half of the society and most important you give birth to men. So, don't say you are equal.. you are far more superior.. Happy Women’s Day!! 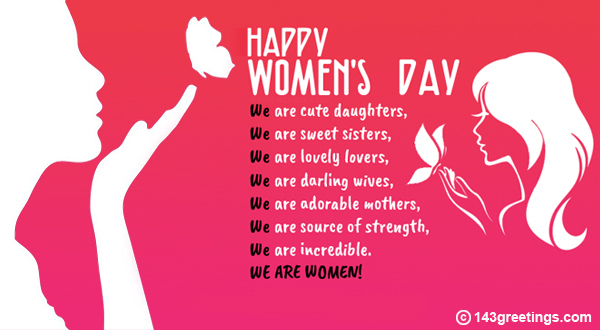 Happy Women’s Day to all loving, caring, sweet and beautiful women inside out. Women have played a significant part in shaping the society. They have proven their mettle be it as leaders of nations, heads of corporations, in the military, bureaucracy or other powerful positions. Their contribution to the economy, society or politics is highly appreciable. So, on this Women’s Day, send some wonderful messages to the women who matter the most to you. It's you who is making a diffrence in a lot of lives...So, proud of you.. Happy Women’s Day! The patience to understand, the willingness to do hardwork and the heart to care can only be found in a powerful woman.. You are one!... Happy Women’s Day!! Be ferocious, be kind, be strong and be wild.. because you are a powerful woman... Happy Women’s Day!! She said she don't want to live in cage so she opened her wings and started flying.. She is not a bird in a cage.. She is born to fly.. She is you.. You are a powerful woman.. Happy Women’s Day! Fall in love with yourself everyday and realize your worth.. You are everything you want.. Happy Women’s Day! Only a powerful woman can balance her sadness with grace, fear with strength and pain with love.. Happy Women’s Day! She may have chaos in her brain, but she also has fire in her soul...Happy Women’s Day! Only a woman can almost die and give birth at the same time.. Be proud to be a woman... Happy Women’s Day!! A woman is a combination of beauty, power and brain... Be proud of who you are!... Happy Women’s Day! Salute your hard working female colleague for her valuable contribution to the organisation by sending her some heart touching Women’s Day messages. Below are some wonderful messages that would make her happy and encourage her to do even better in her life. We the one who makes the office environment cheerful. Without us noting is blissful. Enjoying your women hood. Happy Women’s day. You the force that drives the world. You are the one who has taught love. Happy women’s day. You know what, when you are not in the office, it troubles me more than attending a finicky client. Love you, Happy women’s day. Women are made to spread happiness and bring cheer around. Happy women’s day and have a great day. It is difficult to work in a office that has no women colleague. You don’t just bring cheer, but you create the wonder. She is caring, loving and would always be there for you whenever you need her because she is your best friend. So, on this Women’s Day make your friend feel a bit more special by sending her a lovely message. Just scroll and you would find tons of them. Happy women’s day, dear! Don’t take this just as another day. Instead, this is your day. Live it and have fun. The women’s day is made to celebrate the women hood. Happy women’s day and have a great day dear. Every woman is an example to show something positive to the society. Be proud to be a woman. Happy women’s day. Men only showcase the dark side of women, thinking that by doing so they will show their importance, But I’m not so. Happy women’s day. Here is an awesome collection of Women’s Day messages that you can send across to your female clients or associates. Just scroll down and you would come across dozens of messages. Just check out which messages suits you and send it across. This is a sure way of telling them how much you appreciate being associated with them. Only a woman can understand the importance of working with a woman boss. Happy women’s day. You are the true example of time and effort management. Big salute to all working women. Happy women’s day. One can not find the word ‘No’ only in a woman dictionary. They are always prepared and ready for everything. Happy Women’s day. No matter at what position u all are working in our firm. For us you are all the best managers. If someone has to learn the managerial skill, I suggest learn from working women, and you will never have any question. Whether it is your mother, sister or friend, she always wants to see you happy and does all she can to make your life better. Now is the time to repay. Do this by sending her a funny message that would make her laugh. Check out tons of fantastic messages below. Everyday in our house is women’s day, still I would not mind wishing you the Happy women’s day. I am not the slave of my wife, I just love her and follow her orders as she is always right. Happy Women’s day. The best way to make a woman happy is, keep saying you are the perfect and I love you. Happy Women’s day. A mother’s love is selfless. She will always sacrifice her happiness to see her children happy. So, on this Women’s Day make her day special by doing something special for her. 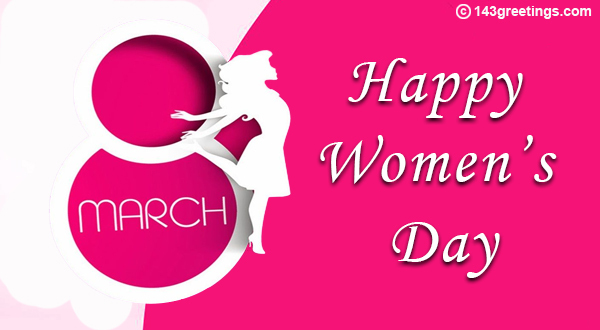 But, begin the day by sending her a lovely happy Women’s Day message to appreciate all that she has done for you. This would surely make her day more memorable. Mom, whatever I am today, it is just because of you. You are my inspiration and motivation. Happy Women’s day. When I think about an empowered woman, no personality comes to mind. For me, you are my superhero. Happy Women’s Day. I always wonder Mom, how you managed your job and family so efficiently, that no one has any grudge for you. Happy Women’s day Mom, you are best women in my life. I love you the most. Love you, stay with me always. Hey Mom, now that I have become a mom, I understood all your lessons. Happy Women’s day to you. Love you.